When you save your settings, we'll start sending emails through your Mandrill account. Please note that if you're using the Mandrill unsubscribe, those unsubscribes will not be tracked in Customer.io. They'll only be tracked in Mandrill. 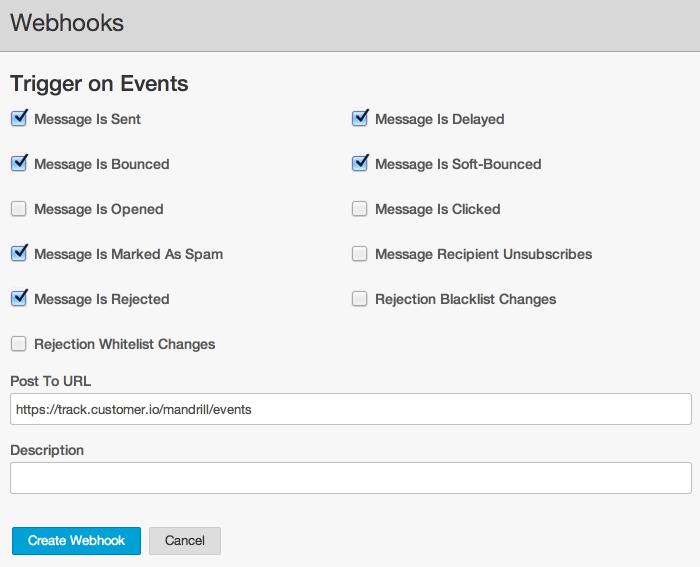 Go to the Mandrill webhooks page and click "Add a Webhook". Click Create Webhook to save. Mandrill's CSS inlining can interfere with our own, so we recommend disabling it. To do so, visit the Mandrill Sending Defaults page and make sure the Inline CSS Styles In HTML Emails option is disabled. Your account is now set up to send email through Mandrill. If you have any questions or feedback about setting this up, just get in touch and we'll be happy to help!